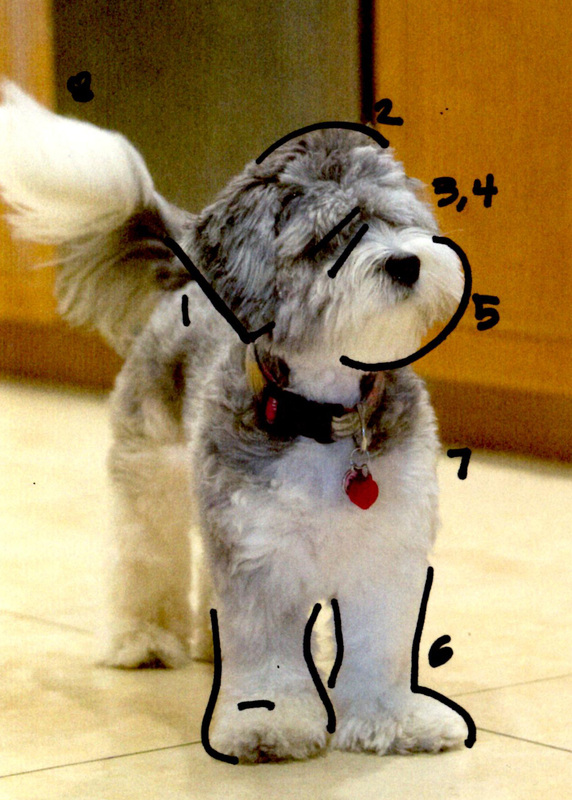 Should your Labradoodle coat be short, medium or long? How to groom a labradoodle. 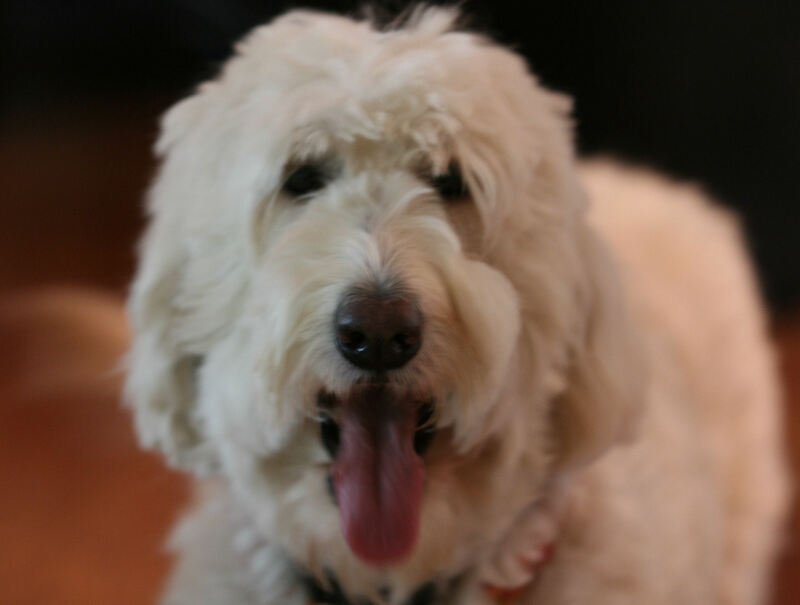 I believe Australian Labradoodles should have a natural look even after being groomed. 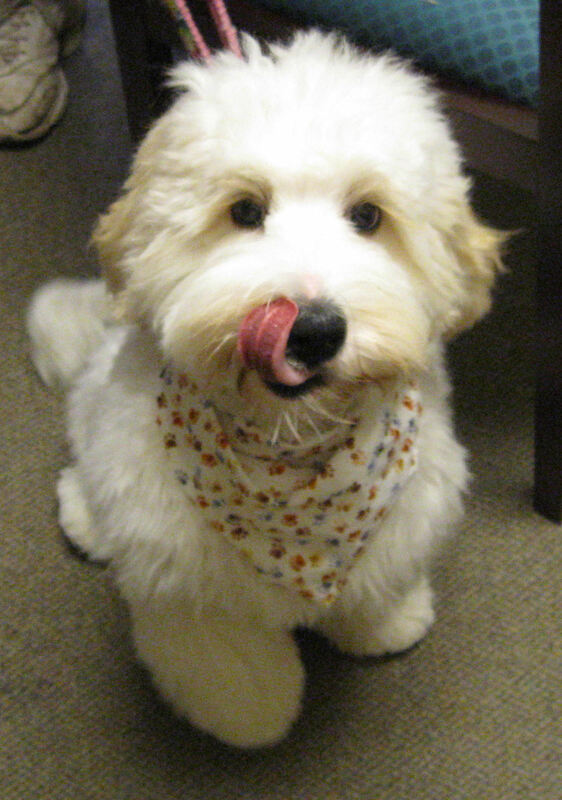 If you find a picture of a labradoodle cut you like, print it and take it in to the groomer. I personally like to just have their BODY shaved (except HEAD, TAIL, and FEET) twice a year to about an inch or shorter and trim the rest (head, tail and feet) by hand more often. This does not mean twice a year is the only time you give them a bath or minor trim of course. Twice a year I shave the main body down to about a half inch. This is neck, body to knees including belly and tush. Monthly, I do a minor trim. This involves trimming the head, tail, tush, and feet. As needed, I use an excellent pair of thinning shears to remove matts. I find the more you brush and fuss with their coat the more they tend to matt. If they smell for some reason I give them a bath. If I need to give a bath I usually thin matts, do a head, feet and tush trim and then bathe and towel/air dry. Trim the ears. Along the back edge of the ear tight and curved along the ear leather. Length of ear should be short to just short of the nose if pulled forward. Hair on the ear should be layered on the outside to about an inch and shaved underneath the ear leather and behind the ear against the neck. Clean out hair in ear canal. Top of the head layered about an inch or two long. Trim the top of the head above the eyes at an angle short just over the eyes, try and leave long eyelashes to allow the eyelash to hold up the hair on top as it grows. You want to see their eyes easily. Below the eye at the muzzle, trim the top of the muzzle short at an angle just under the eyes so they can see easily. The muzzle should be layer and round NOT long and blunt cut. about 1-2 inches all the way around. Feet, shave the body but leave below the knees what I call "Doodle Boots" hand trimmed to be big, round and floppy. Not short poodle feet. What tools I own to groom my dogs? Bath: I use any puppy shampoo that smells good. To trim above and below the eyes: Tweezerman Baby Nail Scissors, these are sharp, curved and have a blunt end, so no poking eyes. To work in the ears: Miracle care, Ear care, Ear powder, step 1. This makes it super easy to just pull ear hair out with your fingers and for hair that is deeper inside I use a pair of hemostats my vet gave me. Note, I also feed coconut oil daily (1 tsp per 10 lbs) to keep bacteria away. To work all over in general: a fantastic pair of thinning shears (the Geib thinning shears I have are no longer made but I suggest Geib Gator 40-Tooth Double-sided thinning shears) plus a great pair of scissors, make sure the point is not too sharp. As for a brush, I have the les pooch, but it is almost exactly like the ActiVet Mat Zapper Red German Grooming Brush 4.5 cm, which is easier to find. Remember, I do not brush much just where matts are found. For the body I use an Oster Grooming clipper, Kool-Lube and a number 10 blade (belly, under and behind ears) and 5FC blade (body). Thin all mats with thinning shears, brush or pull the matts out, trim with scissors all over to the desired length Or shave the dog down to about an inch all over the body (not knees to feet, head, or tail) and let it just grow out (number 10 blade and E comb) . 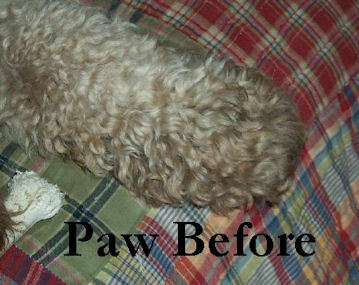 This can be done twice a year and ends with the least amount of grooming required over a year. Taper hind quarters to tail gradually with shaver or scissors don't shave the top of the tail. Make the transition from body to tail a gradual transition. Shave or trim close the tush and private areas. In the summer, I usually shave the belly super short to keep cool and dry fast if swimming. Click for Ear Powder this is the product I use which works great. I do not squeeze it in, it tends to clump out in a big spurt or not at all. I take a Qtip and open it up and dip the q tip into the powder. This will give you a good amount. Rub the Qtip in the ear canal, if you lift up the ear the ear tends to open wide. You can twist the Qtip around and most hair will stick and pull out. Then using your fingers it is easy to remove the hair once the powder is in there. This will both remove the hair and dry out the ear. Do this monthly (and after a swim) and then feed coconut oil (1 TBL/30 lbs) as a treat and you will never have ear infections. I do shave the ear underneath and behind the ear to allow more airflow. You can ask the groomer to do this as well. This will keep ears from getting bacteria. Thin out or shave with medium blade, the hair on neck just behind and under the ears to allow ears to lay flat and air to get under the ear. 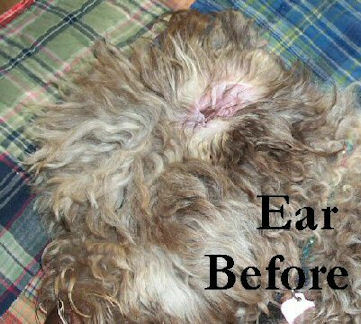 Usually the coat below the ear flap and along the neck gets matted due to a collar, so shaving it helps with matting as well. Trim outside of ear flap (this is the hair hanging down on the ear flap pictured below left), it should be layered. 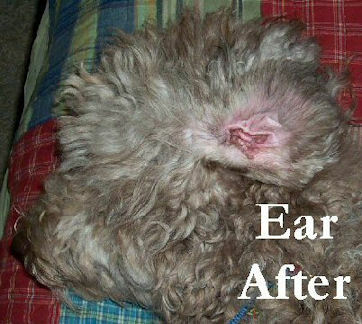 The outside of the ear should NOT be a long blunt cut like a cocker spaniel. The hair should be pulled outward and layer trim to about an inch. The length of the ear hair should be cut to a length that when you pull the ear forward the hair ends between the nose and canines (long teeth). Pictured below right. I then trim the back side of the ear in a curve along the ear leather line. The muzzle should NOT be long and then blunt cut. It should be a round circle with a short edge at the top near the eyes, so they can see. Trim the top side of the muzzle (from the eye to the nose) at an angle starting at the nose about 1-2 inches above the nose angled down into the stop (point where muzzle transitions to head). Pictured below left. Top along eye. Trim the muzzle below the eyes short just inside the eyes almost to a point to allow clear vision. Pictured below right. Trim hair along lip line to keep hair out of mouth, you can also just thin out that area. Lip line hair should be thinned and left about 1 inch at most below lip. You may want to thin out with thinning shears under chin to neck, an area that can mat easier. The beard should round out the look. I trim the muzzle to about an inch or two all around. This area as well should be natural. Pull all the head hair forward to above the stop (where muzzle hits the head). Then trim across at about 2-3 inches above the eye. This will make the head hair shorter at the eye to allow for good sight and gradually longer towards the back. 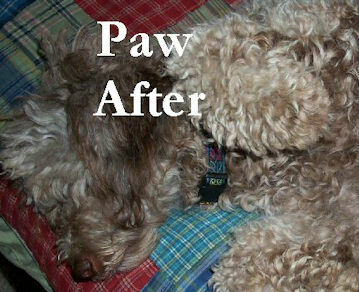 Round off the FEET to "Doodle Boots"
DO NOT brush again, treat it like a human perm. either air dry or dry without brushing using fingers to scrunch coat as you go. This keeps hair corded not fuzzy. Pictured with the scarf and tongue out is one of our families pet puppy, McKenzies mom took in our directions to the groomer. I have to say they did a great job and followed directions. I think McKenzie also thinks she looks beautiful. For the big stuff use a groomer, and please take in a photo of the cut you desire. The person who got me started in my interest in dogs is a wonderful breeder, groomer and vet tech. I cannot thank her enough for her help in inspiration. The following pictures are of her grooming work on Callie and also some pictures of Stella groomed. 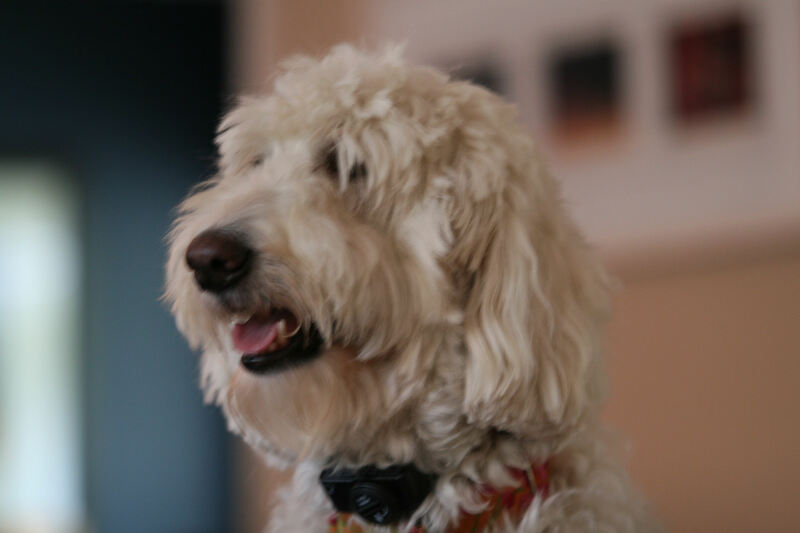 Callie is an Australian Labradoodle and Stella is a F1b.